It’s not just SriLankan Airlines that’s in the red requiring immediate resuscitation but the nation’s economy as well. It should have reached the stars after the battle was won in 2009. It seems God did not confer such great blessings on Mother Lanka. Or were the citizens just cheated, deceived and taken on a huge ride where billions if not trillions of rupees just got evaporated? Anyway, the nation is in a dilemma, exponentially increasing issues. They seem to cascade. Only responses are meaningless rhetoric, characteristic hyperbole and downright balderdash. The jolly citizen Silva from the island paradise shrieks “ohama yang, ohama yang”. It’s outrageously ironical that at a time when the global airline industry continues to grow with projected global revenues expected to exceed a trillion dollars our own “cash cow” with all her inherently radiant beauty, dazzling features and great attributes as a unique marketable product remains calamitously struck, wantonly abused, egregiously misused and the entity converted to cacophonous bagnio. 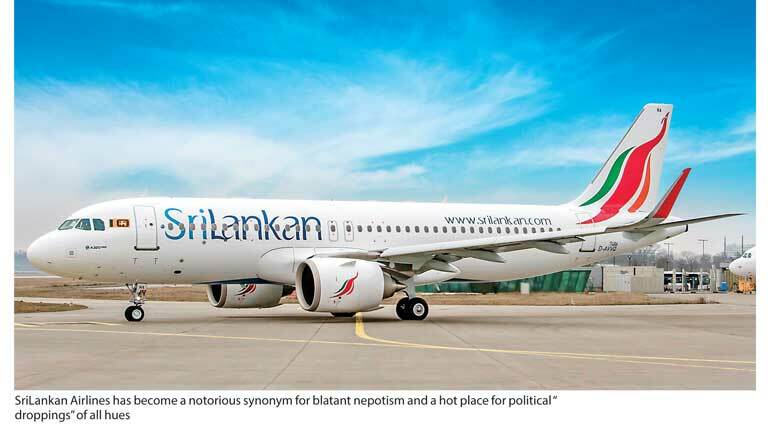 SriLankan Airlines has become a notorious synonym for blatant nepotism and a hot place for political “droppings” of all hues. Reminiscent of a typical village setting in South India where invitees preparing for a social event in the city hire a bus and load all and sundry for the journey. Some even bring poultry, others dare with the four-legged. This is exactly how the National Airline has turned out to be. Treated and managed especially by the previous regime in the most despicable manner. Obscene salaries disproportionate to performance. Hiring and firing of CEOs analogous to changing of undergarments, not to mention political rewards for party loyalists courtesy of SriLankan Airlines. Then there is the ugly spectacle of the Emirates-appointed Chief Executive of SriLankan Airlines Peter Hill. He had his work permit revoked following a dispute with the former Sri Lankan President. It all started when Hill refused to bump 35 passengers from a full London-Colombo flight to make way for Sri Lanka’s President and his jumbo entourage. The rest is history. The disreputable panderers to make the rotting more interesting increased the number of birds and created another brand, another airline. Filled it with sybarites and profligates to advance its decrepitude and moribundity. Politically-connected septuagenarians, paramours of VIPs, female acolytes of youth-wing political parties and general loafing factotums found unhindered refuge in the bordello. If this was not enough, flights were diverted to pick up friends of politicians and VIPs. Surely the canine species too got royal treatment from the airline. Its signature ‘You’re our world’ was indeed inclusive and expansive. The debilitating scourge well lubricated with taxpayer’s funds. SriLankan Airlines, the flag carrier of Sri Lanka and a member of the oneworld alliance, was doomed to crash from the very inception. Launched in 1979 as Air Lanka, successors to the original Sri Lankan Flag carrier Air Ceylon, it never actually took off due to politics and politicians of “Aasikland” – a rare breed indeed. She just kept plummeting to earth, only supported by timely interventions to prolong the inevitable. Following acquisition in 1998 by Emirates hopes were re-ignited. A re-branded jet flying low over Colombo Galle Face was really something. I remember that day quite vividly. Like a kid watched the aircraft pass me. Its livery emboldening, partnership solid. It was heart soothing. As a hard-core marketer and a firm believer in its business philosophy I thought the worst was certainly over for the airline. How woefully wrong was I? Intoxicated with power and exuding disdain and heedlessness, the previous regime didn’t care two hoots. It had to do what it had to do. A treasure trove converted to a s**t-hole – to borrow a term from the “great” Donald Trump. It’s no surprise why the earlier tagline – ‘Taste of Paradise’ – had to go. A little bird whispers that dwellers of paradise had disowned the airline and kept a distance whenever the “dhandu monara” got closer, “Appachhia ganda” seemed to have been the stentorian exclamation. The airline business is not transportation business, certainly not. Such optics are inherently detrimental and constitutes a gnawing myopia. It’s service, hospitality and more importantly experience. The accent is on how to evolve and efficiently manage the evolution. Every member of the airline fraternity strives to out beat the other by providing a pleasant and outstanding experience and being rewarded with higher customer satisfaction and loyalty. Success is not overnight. It takes years of hard work, commitment and tenacity. This is why the management needs support from governments and not unsolicited interventions. They are a drain on precious and scarce resources. If the complex business mantra of managing an airline is easily replicable, tomorrow Zimbabwe could purchase an Airbus 380 superjumbo and catapult itself to a number one position. That’s not how it works. It starts with a brand that’s strategically developed. It does not work in a lacuna but in relation to competition and in a clearly identified space. In this regard what Sri Lanka has in terms of product attributes is far superior to either Singapore, Dubai or Qatar but thanks to our politicians we lost it all and maybe lost it for good. A brand is a complex amalgam. It represents meaning through a process of multi-dimensional action. Main function of a brand is to create distinction and clarity in an extremely busy marketplace. One should be able to differentiate the offering clearly from the competition. The manifestation of the brand must resonate well with the target audience. A beating drum that pulses through how you and your employees make decisions, interact with one another, and deliver on your promise. This brand identity must be cleverly, persuasively and decisively communicated and customer/s must see reciprocal consonance not dissonance. Your brand is not one but all of the above, working together constantly to form a cohesive whole. It’s much more than swapping out the logo on the homepage. ‘Marketing from the Inside Out’ means thinking strategically and holistically about identity and purpose. Take the iconic Singapore Airlines (SIA) and its long and enduring journey. Training, training and training takes a service to real tangible heights. This is the success of SIA. This is the core – the service, not easily replicated. Service levels are so highly systematised at SIA it tells its male and female cabin crew and airport staff how to cut their hair, what color makeup to wear, how many teeth to show in a smile, when not to smile, how to make even the plebeians in economy feel like they are getting great personal service, etc. This is what is known as going to the length, breadth and depth of an ecosystem. Also SIA prides itself in the advantage of a politics-free top management. SriLankan Airlines can learn a lot from this. Service that is unparalleled, whether cabin crew or ground staff. Flights rarely delayed. The refresh paper towel is unique, its redolence patented. Good food and with choice, importance to local menus and cuisine. Choice of international brand of beverages. SIA maintains a young fleet and works with close coordination with the Singapore Tourism Board in attracting millions of tourists. In 2016 the Emirates Group announced its 28th consecutive year of profit and steady business expansion. The Dubai-based aviation group ended the financial year (to 31 March 2016) with record profits of $2.2 billion up 50% year on year, despite global economic and political challenges. Emirates Airline’s total passenger and cargo capacity reached 56.4 billion ATKMs (Available Ton Kilometres), cementing its position as the world’s largest international airline. Even India which opened its economy long after Sri Lanka did has put its house in order vis-à-vis the airline industry. Post liberalisation has paid dividend after the initial correction. Deregulation seem to be working.